On February 9, an Air India flight brought from Kathmandu to Delhi one of India's most wanted Amit Kumar alias Santosh Raut. From his non-descript nursing home in Gurgaon, Haryana, Kumar allegedly ran a multi-crore rupee business duping—or forcing—poor labourers into donating kidneys, till his luck ran out after weeks of media outcry. He is in judicial custody now. Organ donation is front-page, prime-time news. Organ scams are nothing new. Each time a case blows up, the media goes into overdrive. Sordid stories get splashed over the print and run through the day on 24-hour TV news channels. Each scandal is a gory reminder of the ease with which the bodies of the poor and the vulnerable can be cannibalized. 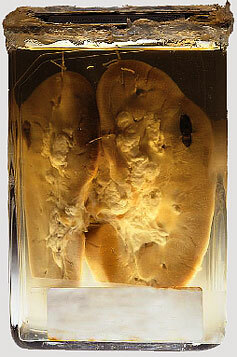 Each expose also betrays a terrible discordance between the demand for organs and the paucity of their supply. How do organ racketeers flourish? Is the country's organ transplant act adequate? Or is it a question of enforcement? Is the medical establishment complicit in this sordid business? "When I tell my colleagues I have not urinated for more than three years, they think I am making excuses to shirk work. They do not understand how painful dialysis is. It leaves me terribly weak. But then I cannot afford to miss work. My monthly expense on medication and dialysis exceeds Rs 30,000," says Nozer H Canteenwalla, who suffers from end-stage renal disease (esrd). Three times a week, the 42-year-old development officer at a Mumbai-based insurance firm leaves office early for a dialysis session at the city's Lilavati Hospital. A kidney transplant could have brought an end to his travails but Canteenwala hasn't found a donor in five years. 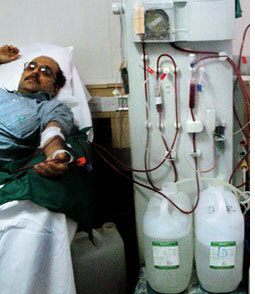 "Getting an unrelated donor is extremely difficult in India. Cadaver organ donations are extremely rare in the country.Dialysis just delays the inevitable," says Meeta Shah of the Narmada Kidney Foundation in Mumbai, an institution Canteenwala visits often to get information on esrd. Vatsala Trivedi, secretary of Zonal Transplant Coordination Committee (ztcc)--an organization that coordinates between hospitals to improve organ donations and transplantation system in Mumbai--concurs. "There are barely 15 kidney donations in a year in Mumbai, while 100 people are added to the list of patients requiring a transplant. Eight hundred and fifty people are listed with us for a kidney transplant in the city," she says. Trivedi notes that only half of the organs donated in the city come from cadavers. Exact figures of esrd patients in the country are not easy to come by. Conservative estimates put their numbers at several hundreds of thousands. "Every year an estimated 400,000 Indians develop esrd. Of these, barely 15,000 receive regular dialysis. And there are not more than 4,000 transplants in a year. So, about 380,000 patients remain outside the pale of the formal healthcare system. Where do they go? It's anybody's guess. It's no surprise illegal organ trade flourishes in India," says Bharat V Shah, a consultant nephrologist with Lilavati Hospital, Mumbai. The government's estimates are somewhat conservative. But even they betray the enormity of the problem. "There are about 400,000 organ failure cases in India every year. 150,000 of them are esrd patients. But only 35,000 organ transplants have taken place since 1994, when the Transplantation of Human Organs Act was passed," says a source at the Directorate General of Health Services (dghs). Most doctors blame the demand supply hiatus on the organ transplant act. It does not put any fetter on "near relatives"--spouse, son, daughter, father, mother, brother or sister above the age of 18--donating organs. But things get extremely difficult if the donor is not a close kin. Such a person has to establish "a case of love and affection" with the recipient. Distant relatives find it difficult to donate organs. "My sister wanted to donate a kidney to my daughter Shabana, who suffers from esrd. But she wasn't allowed. Medical reasons don't permit my husband and me to donate," says Shamima Khatun of east Delhi's Welcome Colony. In the aftermath of the Amit Kumar scandal, doctors seem to have become extra cautious about the kinship angle. In many cases, donors have been asked to undergo dna tests, which mean an additional cost of Rs 3,000 to Rs 4,000. "We don't want to take chances," says Harsha Jauhari, chairperson of the department of renal surgery, Sir Ganga Ram Hospital, New Delhi. Illegal kidney transplants at the Army Research and Referral hospital, New Delhi. The racket was spread across Delhi, Rajasthan, Gujarat, Maharashtra and West Bengal. The main accused was Sanjay Singh, grandson of Shiv Charan Singh, former MP from Muzaffarpur, Bihar. He had contacts in the Army hospital. Four hospitals outside Delhi were involved—two in Mumbai, one in Jaipur and one in Pune. Army is investigating the matter. Organ donors have to prove their "affection" for the intended recipient before an authorization committee. Some doctors say that it's often hard to find the committee members when emergencies strike. But R R Katti, assistant director of dghs Maharashtra and member of Mumbai's authorization committee, refutes these charges "We meet on the first and third Tuesday of each month" he says. But then he acknowledges the problem "There should be eight authorization committees in Maharashtra but only five have been formed." Many states, including Punjab and Haryana--where the Amit Kumar racket was unearthed--do not have a single authorization committee. Katti is no supporter of the affection clause. "It's absurd. One surely can't expect the donor to slit his/her wrist to prove affection. The committee has no way but to take recourse to crude subjective methods," he says. Illicit operators find it easy to work around this loophole. The organ transplant act is unequivocal that no money should change hands between the recipient and the unrelated donor. But experts find it hard to believe that this is always the case. "Why is it always that a poor labourer has affection for a rich man?" asks M S Kamath, a medico-legal expert in Mumbai. The organ transplant act stresses on transplants from cadavers. But according to dghs, only 1,000 of the 35,000 transplants performed after the act came into force have used organs from cadavers. A 2006 article in the Indian Journal of Urology notes that 233 of the 8,428 transplants in 13 hospitals across the country used organs from a cadaver. Why hasn't cadaver organ transplant made much headway in India? The reasons are various. "A team of four doctors is required to declare a person brain dead. It includes a neurosurgeon and a neurophysician who do not benefit--professionally or financially--from a transplant. This means that brain death declarations are rare," says an official with dghs. Some doctors say the medical establishment works to the detriment of transplants from cadavers. "Transplants from live donors mean use of more drugs. There is always a junket or two in the offing from pharma majors. So why get into their bad books by doing transplants from cadavers?" asks a senior doctor from Mumbai who did not wish to be named. Others blame the "appropriate authority'' created under the organ transplant act to register hospitals performing organ transplants. "Twenty three hospitals are registered to perform kidney transplants in Mumbai. But most are averse to cadaver organ transplants," says a senior kidney surgeon of the city. Medics like him say the hospitals are cagey in declaring brain deaths, even though such deaths constitute 5-10 per cent of all deaths in hospitals. The kidney surgeon comes up with a startling revelation there has been no cadaver organ transplant at two of Mumbai's most famous hospitals Breach Candy and J J Hospital. "Why don't the authorities revoke the licences of such hospitals?" he asks. But some doctors, like Jauhari of Delhi's Sir Ganga Ram Hospital, maintain the problem is not all the hospitals' making. "Once their loved one dies, the family is too distressed to hear anything about organ donation. And there are detailed criteria for organ retrieval. Brain death diagnosis takes at least four doctors, who are not always at hand. So the organ goes waste," he says. Trivedi of Mumbai's ztcc dismisses these arguments. "The state-run Sion Hospital in Mumbai has conducted 22 transplants from cadavers in five years. Why can't super-speciality private hospitals emulate it?" she asks. There are others like her who feel hospitals haven't invested much in social workers who can counsel the family of a brain dead person to donate his/her organs. D S Rana of the Indian Society of Nephrologists says, "Doctors don't inform relatives about brain deaths lest they be accused of vested interest. Most surgeons do not want to get into transplants," he adds. Nephrologists also say the transplantation act's insistence on organ retrievals at registered hospitals puts unnecessary fetters. "In 2002, when I was practising in Bombay Hospital, I heard of a brain death case in Dombivilli. The parents of the deceased wanted to donate his kidneys. The body was not at a registered hospital, but the organ had to be retrieved quickly. So I had no option but to go against the organ transplant law. Subsequently, a complaint was filed and my transplantation licence was cancelled. I wanted to save two lives. But ended up being punished," says Bharat V Shah. A senior official in Maharashtra believes the government is planning to legalize organ trade. Nephrologists like Bharat V Shah have been advocating this for some time. "Law has made organ donations from a living donor almost impossible and cadaver transplant is not picking up. So the government should allow people to register legally for kidney donation. Such people should be given compensation. This might save many lives," Shah says. Jauhari supports him "There is no long-term risk in kidney donation." Not all medics support legalized organ trade; some point to an ethical aspect. "Given the discrepancy between organ demand and their availability, trade in organs could become corporate business. Would that be ethical?" asks a Maharashtra government health official. Others like Kamath are more vehement "Will health minister Ambumani Ramadoss donate his kidney before legalizing organ trade in India?" he asks. Many fear that legalizing organ trade will only help the illegal trade. "How will we ensure that the donor gets the money? Middlemen will surely take away most of the proceeds," says Katti. But some health officials believe that the market will eliminate the middle man. "Compensation can be pooled and donors paid a monthly interest. The scheme will surely find takers amongst insurance companies," says a government official. But then how many poor people will donate organs knowing they will not get any immediate monetary compensation? Surely not many. There are patients on dialysis for five years. These debates have little meaning for the family of Shakuntala Negi. The 52-year-old Delhi resident has been waiting for a kidney donor for more than two years. "People who want kidneys get it one way or the other. We all know where these organs come from. Who is bothered if scandals are exposed, at least a dying person gets a new lease of life," says Shweta, Negi's daughter-in-law. Desperation such as this works to the advantage of the black market. It is believed that Mumbai is the biggest centre of the illegal organ trade in the country. "Poor migrants are lured into selling their kidneys," says Kamath (see interview). The case of P Ravichandran is an illustration of the illicit system's efficiency . 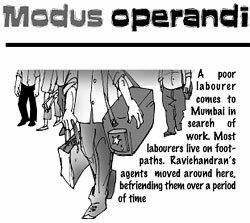 Ravichandran, chief consultant and head of nephrology and transplantation at St Thomas Hospital in Chennai, was caught in Mumbai in 2007 for carrying out illegal kidney transplant surgeries by duping poor people (see graphic strip). It's very difficult to take action against such violators, says Katti adding, "Only the appropriate authority appointed under the organ transplant act can take action. The police can't arrest people for infringing laws framed under the organ transplant act. At best, they can initiate criminal proceedings against them for forgery or for threatening people's lives. " Katti says hardly any complaint reach the appropriate authority. "Most donors are not nave. Both the donor and the recipient know they are guilty. Poor donors approach us only when they are duped. And then, many go back on their affidavits," Katti says. "I understand it is not easy for the living to donate a kidney; but then why is the government not encouraging transplants from cadavers," asks esrd patient Nozeer H Canteenwala. This aspect of the problem has been obscured in the media spotlight over illegal organ trade. Most doctors believe that cadaver organ transplants hold the key to change. "When the organ trade act came into effect in 1994, the focus was on banning trade in human organs and setting up of a system for cadaver donations. After the Amit Kumar expose, the media has been concentrating on illegal organ trade. But what about a control mechanism?" asks Rana of the Indian Society of Nephrologists. "Cadaver organ does not require a special infrastructure. But rather than encouraging such transplants, the government is promoting transplants from live donors," Trivedi of ztcc rues.She carried out Maharashtra's first successful cadaver kidney transplant on March 27, 1997. She has conducted 36 such transplants since. But there aren't many like her in the country. Rashmi Jadhav, a government employee in Mumbai, is a living testament to the advantages of cadaver transplants. She got a new lease of life after a kidney donation from a brain dead person in 2004. "We do not have the words to thank the parents of our beneficiary," says Jadhav, a resident of a slum-settlement in Mumbai. Developed countries have a lot more people like Jadhav. For cadaver donations provide a large majority of the organs required for transplant. "For example, 95 per cent of kidneys used for transplant in Spain come from cadavers," says Katti. In the uk, one in seven organ transplants is from non-beating heart donors, individuals whose deaths result from heart and respiratory failure. In India, contrastingly, most cadaver transplants are from brain dead people. Organ retrievals are very difficult when deaths happen outside a hospital, medics say. There are many who believe retrieval from the brain dead would go a long way in dealing with the organ shortage problem. "Every year, about 4,000 people end up brain dead in the country. That means 8,000 potential kidneys and corneas and 4,000 heart, lungs, pancreas and livers that can be used for transplants," says Suniel Shroff, managing trustee of the Mohan Foundation, a Chennai-based charitable organization that promotes transplants from cadavers. Many doctors are pinning hopes on dghs' National Organ Transplant Programme. It is slated to be in operation in the next three to four months. dghs sources say the programme will emphasize cadaver donations, and make live donations simpler. "We have proposed that the donor be given medical insurance for three years and the first premium be paid by the organ recipient," says Jauhari one of the programme's architects. Other doctors say that a cadaver donation programme must have the provision for a national network that allows hospitals to exchange organs so that they can be used for the best matched recipient. Creating such a registry is not much of a problem, says Sanjay Agarwal, senior consultant at the nephrology department of the All India Institute of Medical Sciences. The institute has an organ retrieval system which does precisely that. But then it is not a national network. Many doctors are, however, sceptical of registries. For one, doctors cannot legally remove organs without the family's consent. "Anyhow, a very small percentage of people who register as donors will die a brain death," says Sumana Sundaram, project coordinator at the Mohan Foundation. "The challenge is in getting brain dead road accident victims to the hospital quickly," she says. organ retrievals from non-beating heart donors. A draft amendment to the organ transplant act put up on the mohfw's website does not give much space to these recommendations. Is the ministry dragging its feet? No, assures an official at the ministry. "A cadaver donation programme is in the making and it will take another month or so," he says. Trivedi remains optimistic. "If we promote a cadaver transplant programme sincerely, 75 per cent of the organ demand can be met. Only after this option is exhausted should we consider live donor transplants," she says.